A4: 26ppm colour, 34ppm mono; A3: 15ppm colour, 17ppm mono. A4 34ppm mono/26ppm colour A3 17ppm/15ppm print speeds. The ES8461 MFP includes a wide range of in-the-box software utilities to help you manage and improve productivity whilst reducing your support costs. Duplex : 60 - 90 gsm. Duplex 10 ppm color, 13 ppm mono. Interface 100BASE-TX/10BASE-T, USB 2.0 (High Speed), USB 2.0 (High Speed) Host, Wireless via LAN (IEEE802.11a/b/g/n). Print Speed A4 26 ppm color, 30 ppm mono. Used working condition OKI C610 COLOR LED LASER PRINTER. Comes as shown in the picture without toner cartridges. K Toner (8.0K): 80%. C Toner (32.0K): 10%. M Toner (6.0K): 40%. Y Toner (2.0K): 10%. Pick up only, Crouch End, N8, London. Fuser LIfe: 28%. Belt Life: 99%. Condition is Used for aprox 4 years. OKI C711WT full colour CMY-White LED Laser printer. Brand New boxed. Best price. OKI C3300 color laser printer. Condition is Used. Comes as shown in a picture without toner cartridges. 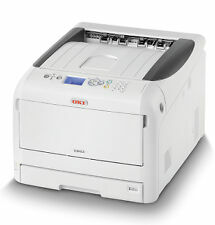 Oki ES5462w Wireless Colour Laser MFP. 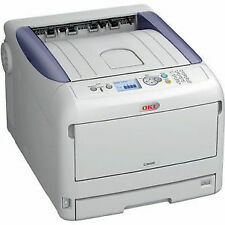 • Oki ES5462w MFP. No other accessories or software are included. Manual and drivers can be downloaded for free on Oki official website. A4 Colour Multifunction Laser Printer. OKI C332dn, AC Cable (UK), CD/DVD (including Software/ Utilities/ Drivers and User Manuals), Setup Guide, Image Drums, CMYK Starter Toners (1000 Pages). Product Group Output - A4. Speed Colour - Up to 26ppm Colour Print. OKI C510DN. 1 x OKI C510DN. Fast USB Network & Duplex Ready Colour Workgroup Printer. A4 High Quality Desktop Colour Laser Printer. Up to 26ppm Colour Print. USB & Network. Up to 30ppm Mono Print. 2400 dpi Print. 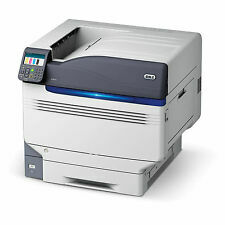 Oki MC363DN A4 Colour Laser Multifunction 46553201 46553201. When new features are available you can update the device via the OKI portal. Google Cloud Print 2.0 ready, as well as being compatible with AirPrint by Apple Inc for printing from smartphones and tablets. OKI MC362DN Colour LED Laser All-In-One Printer 01328101. 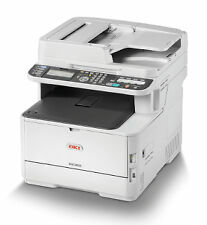 OKI MC362dn colour MFP. 22ppm Colour Print Speed. Printer Type Colour. Product Type LED Multifunction Printer. Print directly from or scan directly to a USB stick without the need of a PC providing added flexibility and improving user efficiency. They are supplied with a testing toner only as we cannot Gaurantee the condition or remaining pages. These Printer are our refurbished Printers. Isle of Man : IM, EVC. Northern Ireland : BTC. Scotland : HS1–9, IV40–51, IV55–56, KA27, KA28, KW15–17, PA20, PA34, PA41–48, PA60–78, PH42–44, ZE1–3. 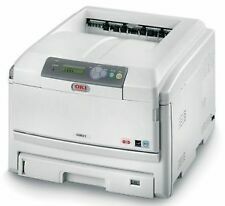 OKI C612N A4 Colour Laser Printer 46551001. And with Gigabit Ethernet on board, you'll transfer those large colour files with ease across the network. The OKI C612n will be productive straight out of the box with easy setup. OKI ES7411DN. 1 x OKI ES7411DN. Fast Network & Duplex Ready Colour Workgroup Printer. A4 High Quality Desktop Colour Laser Printer. 34ppm Colour Print. USB & Network. 36ppm Mono Print. 2400dpi Print. Oki MC562dw A4 Colour Multifunction LED Laser Printer. In Original Box with Part Used Toner. The Printer Broker Ltd is a supplier of printers, fusers and printer parts based in Bolton, Greater Manchester, UK. There is a spare black toner original cost £152. This is a collection only item, you will need at least 2 strong people to lift / collect this printer because it is very heavy and a vehicle large enough to transport it. Part : 46552602. Supplied with 12 month OKI Warranty. The Printer Broker Ltd is a supplier of printers, fusers and printer parts based in Bolton, Greater Manchester, UK. Printer is in working order and is used daily. Due to weight collection only. Part Number : 46551003. The Printer Broker Ltd is a supplier of printers, fusers and printer parts based in Bolton, Greater Manchester, UK. Network Printing. USB 2.0 & Ethernet connections. Print up to 32/20ppm (Mono/Colour). We will always go out of our way to source the product you are looking for. Add to Favourites. OKI MB492DN. 1 x MB492DN Printer. MONO LED MFP. This Is A Grade A Mono MFP Printer. Islands and. Northern Ireland . UK mainland and excludes. If you need help with your installation our engineers will be happy to help you. 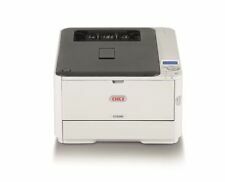 Oki C5650 Colour Laser printer. Good working condition, surplus to requirements. Comes with all cartridges. 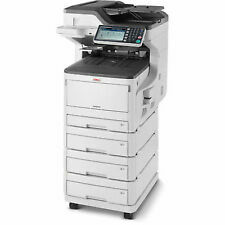 Up to 22ppm Colour Print Up to 32ppm Mono Print 8 Seconds First page USB & Network Optional Double Sided Printing 2400 dpi Print 300 Sheet Input Tray 100 Sheet Multi Purpose Input Tray 200MHz Processor 64MB (320MB) RAM Windows & Mac Compatible Host Based To be picked up from SE3 Blackheath South East London. Printer Spares specialise in the sale of refurbished printers, parts and accessories. They are supplied with a testing toner only as we cannot Gaurantee the condition or remaining pages. These Printer are our refurbished Printers. OKI C5950N. 1 x OKI C5950N. Fast USB Parallel Network Ready Colour Workgroup Printer. A4 High Quality Desktop Colour Laser Printer. USB, Network & Parallel. Up to 26ppm Colour Print. Up to 32ppm Mono Print. USB and Ethernet Connections. Print up to 36/34 Pages Per Minute (Mono/Colour). We will always go out of our way to source the product you are looking for. Add to Favourites. Model : 01181901. The Printer Broker Ltd is a supplier of printers, fusers and printer parts based in Bolton, Greater Manchester, UK. Oki C332dnw Colour Laser Printer 46553102. When new features are available you can update the device via the OKI portal. 26ppm Colour Print Speed. Microfine High Definition toner for superb print quality. (3) A van or large car will be required to move the printer. 1) This printer is currently located in Brentwood, Essex. 2) This printer will need to be moved by at least 2 people due to its weight. Yellow, Cyan & Magenta - 22,000 sheets. Part Number: 46552701. NEW - FULL OKI WARRANTY. The Printer Broker Ltd is a supplier of printers, fusers and printer parts based in Bolton, Greater Manchester, UK. See Pictures for Actual Item Supplied. Automatic Duplex Printing (2-sided). USB 2.0, Wireless & Ethernet connections. We will always go out of our way to source the product you are looking for. Add to Favourites. Part Number: 62441904. Print, Copy, Scan & Fax Functions. Automatic Duplex Printing (2-sided). Network Printing. USB 2.0 & Ethernet connections. Print up to 24/22ppm (Mono/Colour). We will always go out of our way to source the product you are looking for. Add to Favourites. Automatic Duplex Printing (2-sided). Print up to 31/27ppm (Mono/Colour). Print, Copy, Scan & Fax Functions. We will always go out of our way to source the product you are looking for. Add to Favourites. USB 2.0, Parallel & Ethernet connections. Print up to 40/36ppm (Mono/Colour). We will always go out of our way to source the product you are looking for. Add to Favourites. Print up to A3. USB, Ethernet & Parallel connections. Print up to 22ppm Colour. Print up to 32ppm Mono. We will always go out of our way to source the product you are looking for. Add to Favourites. USB 2.0 & Ethernet connections. Print up to 26ppm/30ppm (Colour/Mono). We will always go out of our way to source the product you are looking for. Add to Favourites. OKI MC853DN Colour LED Laser Multifunction Printer. OKI MC853DN Colour LED Laser All-In-One Printer 45850603. OKI MC853dn multifunction colour printer. Combining print, copy, scan and fax functionalities with a large-scale design capable of printing up to A3 in size, the printer is well-suited to a wide range of tasks and professional responsibilities.